The Biometrics Research laboratory is located at the Highland Drive division of the VA Pittsburgh Healthcare System. The lab is housed in a 1600 foot space and includes a spacious area for laboratory apparatus and a separate, large testing room. Office space for research staff. A waiting room, kitchen, and conference room are located adjacent to the lab. The Biometrics Research Lab is designed for measurement of psychophysiological responses. Measures currently obtained include pupil diameter, EEG and event-related potentials, electrooculogram, electrocardiogram, and electromyelogram activity. An ISCAN model RK406 infra-red TV pupillometer provides analog and digital outputs corresponding to pupil diameter at over 60 Hz. Remote control over camera placement allows small head movements without interruption of signals. Amplification of EEG and EKG measures is provided by Sensorium amplifiers (32 channels). Grass model 12 Neurodata amplifiers are also available. Heart rate data are recorded through use of an R-wave detector which outputs a computer-compatible pulse on the detection of each R-wave in the ECG record. Additional equipment includes an eight channel Tektronix storage oscilloscope, Grass photostimulator, Hewlett Packard multi-meter, a Hewlett-Packard dB attenuator, and a Hewlett-Packard counter/timer. The Biometrics research lab has numerous PC computers that contain relevant software packages for stimulus presentation as well as statistical behavioral and physiological data analysis. The primary physiological data recording system for this project is a Dell Pentium III 650Mhz PC equipped with a Scientific Solutions Labmaster AD interface board, with mass data storage provided by a JAZ 2GB removable hard drive, CD-ROM, and a local area network (10BaseT) to other lab computers. 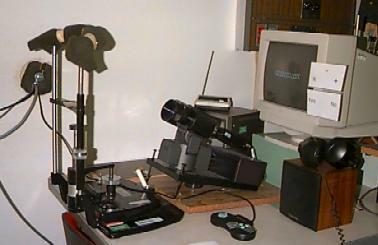 Physiological data collection and brain mapping are controlled by EEGSYS software and additional specialized software running on a Dell Pentium III 650MHz computer with a recordable CD-burner for economical mass storage of data. Statistical data analysis is done using SPSS for Windows and MATLAB. A Dell Pentium III 750Mhz PC is used for control of visual stimuli. Printers include a Hewlett Packard 4550N Color LaserJet Printer and 870 Color Ink-Jet printer, and numerous Hewlett Packard LaserJet 5P printers. Also in the lab are multiple Dell Pentium III computers with relevant word processing, statistical, and presentation generation software.